This Spicy Grilled Eggplant and Zucchini Salad with Thai Flavors is amazing, and it’s one of the reasons I’m always saying is give grilled eggplant a chance! And this delicious salad with grilled eggplant and grilled zucchini is low-carb, gluten-free, meatless, dairy-free, and South Beach Diet Phase One. Click here to PIN Spicy Grilled Eggplant and Zucchini Salad with Thai Flavors! I’m hoping this amazing Spicy Grilled Eggplant and Zucchini Salad with Thai Flavors might convince some eggplant-reluctant people to try grilled eggplant! Recently I made this very tasty grilled eggplant and zucchini salad with my nephew Jake. We both loved the Thai flavors in the dressing, and absolutely devoured the salad, with both of us loving the grilled eggplant with slightly charred skin. Then over the next couple of days I told various people about this new favorite salad, and one after the other they told me “I don’t like eggplant.” And I patiently explained to each person how I never liked eggplant either, until I tried grilled eggplant. So if you like Thai flavors, I’m urging you to be adventurous and give grilled eggplant a chance. Of course you could make the salad with all zucchini if you insist, but Jake and I both thought the grilled eggplant was so spectacular in this that next time I’d probably skip the zucchini and use all eggplant. I used the long skinny Japanese eggplants that are growing in my garden for this, and I’d recommend using some kind of Asian Eggplant, since they work so well on the grill. This type of eggplant variety doesn’t need to be peeled or salted before cooking, and they’re also great for stir-fried dishes with eggplant. The Spicy Grilled Eggplant and Zucchini Salad with Thai Flavors was slightly adapted from one I found in Vegetables Every Day, a book I’ve used over and over for interesting ways to cook vegetables. Cut off the ends of the eggplant and zucchini, then cut into lengthwise pieces. Brush all sides with peanut or grapeseed oil and season with salt and pepper. Here’s the eggplant and zucchini on my well-used grill. I wanted to get grill marks on two sides, so I put a flat side down and then watched for grill marks to appear. When the first side had nice grill marks, we flipped the veggies to the other flat side. As you can see, the zucchini in the front are taking longer to cook than the eggplants. After 15 minutes the eggplant was all nicely charred, but we left the zucchini on for another 5 minutes. You also might cut the zucchini a little thinner than the eggplant. Let zucchini and eggplant pieces cool on a cutting board. Top each serving of salad with a couple of spoonfuls of chopped peanuts and serve. This Spicy Grilled Eggplant and Zucchini Salad with Thai Flavors is the recipe to try for grilled eggplant! Wash and dry eggplant and zucchini, trim ends, and cut into lengthwise strips. Brush vegetables with oil and season with salt and fresh ground black pepper. Lay strips on the hot grill, flesh side down and cook about 5-7 minutes or until grill marks appear. Turn vegetables and cook until that side has nice grill marks, about 5-7 minutes more. Zucchini may take slightly longer than eggplant, but grill all vegetables until they are nicely charred and cooked through. As they are done remove the vegetables to a cutting board and let them cool to room temperature. While veggies cool, whisk together the lime juice, fish sauce, Sriracha Sauce, sweetener of your choice, and oil. When vegetables have cooled, cut them into short crosswise pieces. Toss with a few tablespoons of the dressing, and let them marinate while you finish prepping other ingredients. Slice the green onions into thin strips and chop the cilantro, mint, or Thai basil. Serve salad in individual bowls, topped with a few spoonfuls of chopped peanuts. This kept reasonably well overnight in the fridge, but it was best freshly made. I think the dressing would be good on many kinds of other grilled vegetables like peppers, onions, sweet potatoes, or winter squash. Recipe adapted from Vegetables Every Day. 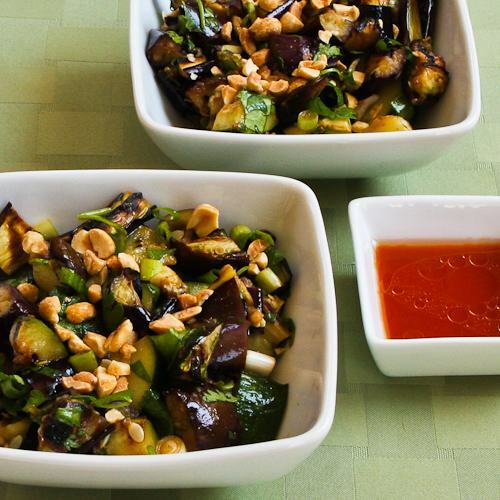 Using an approved sweetener makes this Spicy Grilled Eggplant and Zucchini Salad with Thai Flavors a perfect salad for any phase of the South Beach Diet or any type of low-carb eating plan. (Even if you used sugar, there isn’t much sugar in this dish.) I would serve this with any type of grilled chicken, fish, or meat. If you want nutritional information for a recipe, I recommend entering the recipe into this nutritional analyser, which will calculate it for you. Or if you’re a member of Yummly, you can use the Yum button on my site to save the recipe and see the nutritional information there. Terrah, you can also use Uncle Ben's Converted rice (white or brown) which is one of the most low-glycemic types of rice, due to the converting process. I use it a lot when I don't want brown rice. Oh, it came out SO GOOD…. The Japanese eggplant roasted so sweet and silky! The only thing is next time, I'll start roasting the zucchini first, as it's more hearty in texture. But all of those flavor married together. Along with the aroma of jasmine rice, my apartment smelled like a restaurant! I couldn't help thinking to myself that if I'd used brown rice, the meal would have been TOTALLY SB phase two, lol. Terrah, that definitely sounds good to me! First, let me just say that I actually planned my latest shopping list around many of your blog recipes! I haven't been on South Beach for many years but I still love the idea of eating veggies, fruit, lean meat, healthy grains. Now, I went shopping as I said. I bought lots of zucchini and my first Japanese eggplant. I love Italian but it makes my tongue tingle a little. I hear Japanese eggplants are the solution for people like me. I don't have a grill so I'm just going to roast them in my oven with some peanut oil that I did have. I'm also going to add a little chicken to this. Finally, I'm topping this with some premade Thai peanut sauce I have on hand. Serving this with Jasmine rice. This is my dinner tonight. Can't wait! Thanks Lydia, love this salad! I used to be one of those "not crazy about eggplant" people, but I love the seedless Japanese eggplant. Grilling it with Thai flavors is inspired! So glad you have been enjoying the blog. I'm not sure what would be a vegetarian substitute for fish sauce; have you tried googling it? I would love to make this dish for my daughter. She is a vegetarian and so I can't use fish sauce. What should I use as a substitute? I'm a big fan of your blog. I love your recipes!! Jen, so glad you liked it, and what a great idea to broil the eggplant. Wow, this was AMAZING. I had to make some adjustments, as I have no grill and don't like zucchini, so I broiled half inch eggplant disks until browned and tossed in some spinach and tomatoes. Next time I'll broil some portobella mushrooms with the eggplant. Tasty, filling and great for work lunches. Thanks for another fantastic recipe! Rebecki, that is fantastic! So glad to hear about your success. We made this the day after you posted the recipe and served it warm over brown rice. I loved it – but squirted some extra sriracha on it (love that stuff). Thanks, Kalyn. I've been beaching it for 15 months and lost 70 pounds with your help. Miriam, hope you enjoy it! I just bookmarked this recipe- it looks DELICIOUS. You had me at grilled zucchini. 🙂 Thanks for sharing! Your pictures are great. I can't wait to make this dish very soon!! Soma, my pleasure! Glad you liked this idea. I can eat anything eggplant and I think grilling elevates the flavors.. ahh the smoky aroma of eggplants. Kalyn love the dressing here, esp the use of Sriracha and also the peanut topping. Thanks Maria, I loved the dressing! Love the Thai flavors! Great recipe for this time of year. Thanks for that nice feedback. Many people are surprised that I have no ambitions to write a cookbook, but I do plan to keep blogging for a long time. This has got to be the most beautiful eggplant dish ever. I would follow your recipe page, if only to look at the fantastic pictures. You've lost your calling–should be a cookbook author. Thanks. Becky, I'm sure you would like this! Wish I had more eggplant and I'd give you some. I need to give eggplant a second chance I think. Maybe I've never had it fresh or I've picked the wrong ones out of the bunch OR maybe I just needed your recipe!! Sarah and Joanne, fun hearing from some eggplant fans! Dave, the skin of Asian eggplants is thinner than that of larger ones, and is very tasty when they're grilled. They aren't mushy if you don't overcook them. Barbara, wish I had more and I'd bring you some. It sounds like a dish my family would love. Now to find some Asian eggplant. HUH… Intresting. I am not at all a fan of the skin of an egg plant. But, wasn't it mushy when you cut into it. When I grill egg plant, I scrape the meat from the skin and make a dip. I must over cook it. Huge eggplant LOVER right here! And zucchini ain't so bad either 😛 I love the sound of this dressing to spruce them up! This sounds fantastic, have you tried making it with Thai basil too? Dara, thanks. We loved it! Lydia, I agree, the Japanese eggplants are part of my new-found appreciation for eggplant. Perfect for the grill. Roz, hope you enjoy it. HI Kalyn, oh my…this looks amazing! I'm going to give this a go soon!!! Great pictorial which has left me salivating for these veggies! Ever since discovering the Japanese eggplant, which are virtually seedless, I've been a huge fan of eggplant. The grilling gives it such great flavor, smoky and not mushy (and I think it's the mushy that people who say they don't like eggplant are responding to). I second your idea — give grilled eggplant a chance! I can't make this fast enough. Really, flavors and fresh grilled veggies sounds fantastic, Kalyn!